I got a Nikon FM3a film camera. This was the latest and greatest mechanical 35mm camera available from anyone. Introduced in Feb. of 2001 it has a production run of almost exactly 5 years. 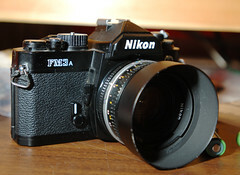 It was discontinued along with a bunch of other film related products by nikon at the beginning of this year. The discontinuation of this camera points to a significant turn for Nikon. One which I hope they will turn around as more of us photographers complain. Nikon is slowly turning their product range away from "Photographers" and towards eletronics consumers. Maybe they have to do this to stay competitive. But I for one am very dissapointed. The end of the FM line is just one example. Another is the move towards G lenses and discontinuation of prime lenses in favor of super zooms. Nikon has always stood for compatibilty. The one manufacturer who has maintained their lens/metering mount since 1977 (incidently the year I was born. Note: Nikons F-Mount has actually been around for longer, but not with AI Metering). Now they're making this great backwards and forwards compatibility between their lenses and cameras a scarce thing. In the meantime I'm really enjoying my trip back to film. This camera is a joy to use. I'm rather happy with the results so far. Here are some photos from a BBQ party at a friends house.